A fan injured by a thrown hot dog is suing the Kansas City Royals. This past season a fan attending a Kansas City Royals baseball game was injured by a hot dog thrown at him by the Royals mascot Sluggerrr. Now he is suing the team for medical bills and pain and suffering as a result of the incident. Laugh as you choose at the apparent frivolity of this case – a team mascot throwing a semi-soft concessions item – but this is a genuine problem because of the results. First things first. Poka yoke, a Japanese term referring to mistake-proofing or error-proofing, is based on the two facts that people will make mistakes and they will make mistakes because the system allows those mistakes to occur. The use of poka yoke concepts reduces (if not eradicates) the opportunity for improper outputs or occurrences to exist. If you can’t error-proof, then error-reduce. If you can’t error-reduce, then quarantine and error-contain. The closer you get to error-proofing the better off you’ll be. Rules and policy should only be used if there is no other way to make sure errors don’t occur. How often do we NOT follow that line of thinking? How often do we encounter problems that we’re just too lazy to actually solve and we instead just throw a rule at it that may or may not make sense and may or may not be enforced? Rules are tricky. Rules are generally punitive. Rules are fluff and not always objective. That’s why lawyers make as much money as they do. But rules are not necessary if proper root cause analysis and proper poka yoke is implemented so that the opportunity for bad things to happen is minimized. Here’s why poka yoke matters in this situation. 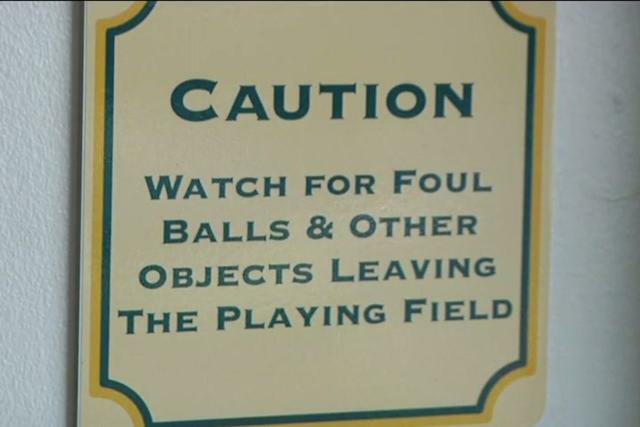 Fans get injured regularly at baseball games due to flying baseballs and bats. However, they typically don’t bring legal action against the teams on the field, for two reasons. One, most game tickets have disclaimers written on the back that warn patrons attending games of the opportunity for injury, and they claim that the teams are not liable for any injuries caused by the game. Two, as Roger Cossack of ESPN explains in the video, there’s apparently a “baseball rule” that protects teams from being sued by patrons in the event of injuries directly arising from attending sporting events and the action on the field/court/turf. Recall what I just said about rules and policy. Well here’s where the legal mumbo jumbo and disclaimer wording makes things sketchy and why rules are silly. There’s also a thought that says if you need a sign, your process isn’t good enough. It can be applied to poka yoke too. This Royals fan wasn’t hit with a batted ball or a bat, and his injury was not a result of what happened in the game. His case is apparently outside of the legal disclaimer on the ticket and that’s why the courts are loathe to throw his suit out on the grounds of the “baseball rule”. The mascot was reckless in tossing the hot dog…behind his back…at the unsuspecting fan. His (or her) carelessness caused harm to the fan. The team should be liable. However, the team tries to protect itself with rules and legal language based on contract law. Compare that with the NHL’s Columbus Blue Jackets. A female hockey fan was hit and killed by a puck that flew over the glass during a Blue Jackets game. While the girl’s family was provided financial restitution, the NHL mandated that every team install protective netting above the glass behind the goal nets to protect fans from flying pucks and prevent such injuries from happening to fans again. Now THAT is using poka-yoke to do the right thing instead of hiding behind legalese. Maybe the Royals don’t use their mascot for tossing food at fans anymore. If Sluggerrr can’t throw food at fans, he can’t hurt fans by throwing food. Right?